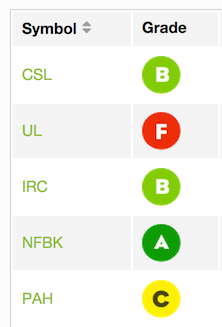 When viewing a stock's page or a scan results listing you'll see a rating for each stock. That rating will be A, B C, D or F. You can think of these ratings as basically a relative strength rating. The bot ranks all of the stocks according to a proprietary algorithm and then assigns A grades to the top 20%, B grades to the next 20% and so on. As of this writing, the algorithm only takes technical factors into account. I hope to fold in some fundamental elements into the mix in the near future. It's important to note that these ratings are *not* predicting any future actions -- they're backward looking. I use the ratings as a quick way to see if a stock is strong or weak. I like to buy strength and sell weakness, so when I'm looking for stocks to buy I'll filter my stock scan results to only show me A's or B's (and maybe C's). Conversely, when I'm looking for short sale candidates, I'll filter the scan results to only show me D's and F's (and maybe C's).